MINNEAPOLIS — July 10, 2015 — Bikeways for Everyone is pleased to announce that the Minneapolis City Council unanimously passed the Protected Bikeway Update to the Minneapolis Bicycle Master Plan, catapulting the City forward toward its goal of being bike friendly for anyone from kids going to school to seniors going to the park. The long-awaited City protected bikeway plan provides a smart blueprint for the critical first stage of building out that network. It lays out a system of up to 55 new miles of protected bikeways, 44 miles of which are identified as “Tier 1” or “Tier 2” projects that should be implemented in the next five years or so. When implemented, this plan will achieve the City’s target of 30 new miles of protected bikeways built by 2020. The City received 1,716 comments on the draft protected bikeways plan–1,683 were generally supportive, while 2 were generally opposed. A network of protected bikeways–where people biking are separated from cars (and sidewalks) by some sort of physical barrier–will connect our world-class trail network with key destinations. This will knock down a major barrier that prevents many from biking, according to Midtown Greenway Executive Director Soren Jensen. “As we’ve seen from the popularity of the Midtown Greenway, we know what happens when protected bikeways are created — people use them. The protected bikeways plan is great news for biking in Minneapolis.” In fact, a 2012 study found that 65 percent of people say they would feel comfortable biking in a protected bikeway, while only 13 percent say they same about a street with no bikeway. New protected bike lanes on the Plymouth Avenue Bridge spurred an 81 percent increase in biking in the first year they opened. 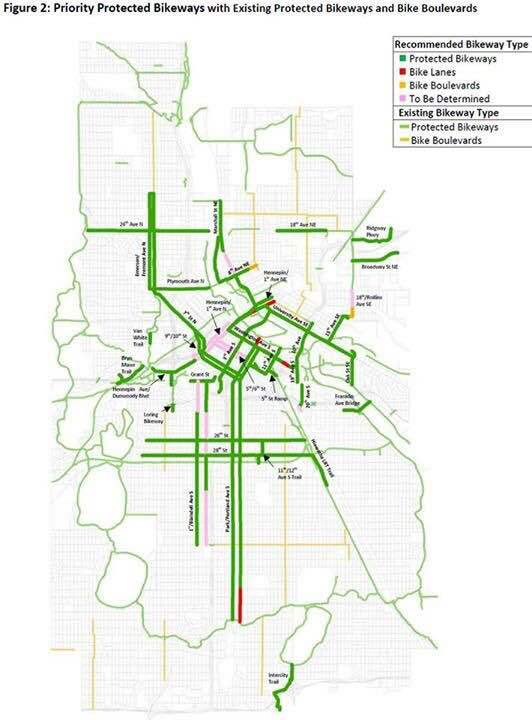 The protected bikeway plan initially focuses on the areas of the city with the biggest barriers to comfortable biking and the most destinations–largely connections into and through downtown for surrounding neighborhoods. 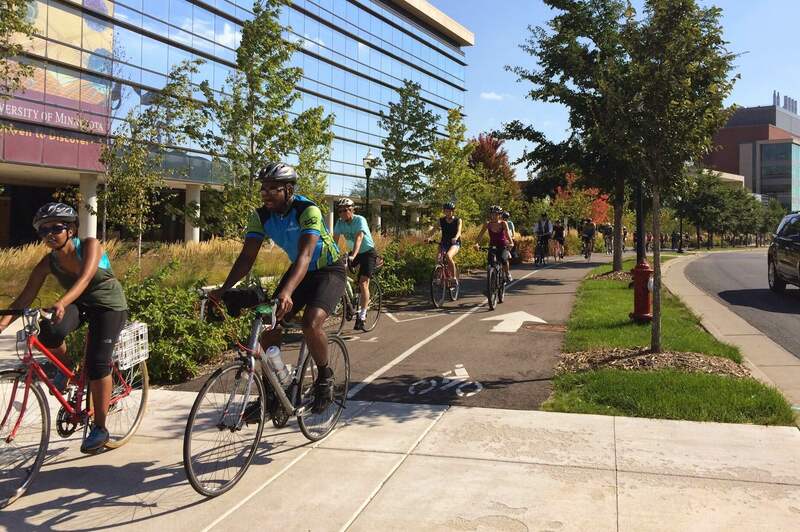 “We are thrilled to see the Protected Bikeways Plan passed by the Minneapolis City Council. These additional protected bikeways will increasingly allow safer biking in our community and active, healthy lifestyles,” said Nice Ride Minnesota Marketing Director, Anthony Ongaro.